MANCHESTER SHOW 2010: Harman Kardon and AKG to reveal new product ranges | What Hi-Fi? 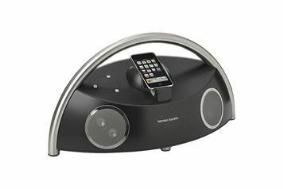 Chief among them will be a compact version of the Harman Go + Play iPod dock, called Micro, a 2.1 system with the ability to stream video from an iPhone or iPod Touch to a TV via a composite video connection. The device can also sync Apple's portables directly to a computer through a USB connection when it's docked. Powered either by the mains or batteries, the Go + Play Micro can last for up to 18 hours on battery power alone and has an eco sleep mode to conserve power. Also on the Harman Kardon stand will be the SB16 home cinema soundbar, which delivers stereo playback or 3D Dolby virtual surround. It includes a 100W wireless subwoofer with 25cm driver, and the soundbar itself has left and right speakers with dual midrange drivers. Coaxial and optical digital inputs enable connection of a TV, DVD/Blu-ray player or set-top box. Finally, Harman will show off the third generation of its iconic SoundSticks speakers, called appropriately enough SoundSticks III, and now featuring new white lights, an added satellite power switch and a discrete braided cable for "better audio performance". And if it's headphones that light your fire, don't miss several new models from AKG on the Harman stand. These will include the Signature Line series designed in partneship with Quincy Jones, the AKG K 840 on-ear models with Kleer wireless technology and the AKG K 830 BT on-ear 'phones with Bluetooth.